This was a pretty cute interaction. Fiona was lying on the couch cushion when Isabel decided to join her. I thought that top photo looked like she was saying, "What is happening to me?" 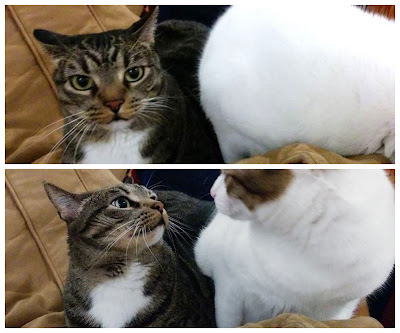 There was a photo that I took in-between, in which the cats touched noses, but then Fiona looked at Isabel (bottom photo) with an "I'm not sure I like this" expression and, sure enough, she didn't stick around. Still, the whole episode was adorable. I'm going to try to keep this short because I'm in a mooood. It's nice out, though (sunny, 70s - the tulip trees are actually blooming), so I'm going to go sit out on my deck and read. That should help lift the sagging spirits. And, because this list is 75% purchases, I've decided I need to attempt a buying ban. I say "attempt" because I'm usually an abject failure at not buying books, but I think it's time to take a break from making book purchases till I've caught up on reading some of what I've already bought, recently. Just the one book. After finishing The Nightingale, I got it into my head that I should focus on finishing The Wars of the Roosevelts. I'm almost done but didn't feel like reading, last night. Oh, well. Soon. I'm focusing on finishing the one book and have set all the others aside, temporarily. They'll show up on next week's Monday Malarkey list in some fashion. There's not much other news, apart from the fact that I finally found a book I've been missing for 2 or 3 months: Mister Monkey by Francine Prose. It was on a shelf that I don't normally use for books in our guest room. I have no idea what possessed me to put that and 3 other books on a shelf that's normally reserved for youngest son's possessions but I'm happy to have finally located the book and will stick it on my February stack. I have to hurriedly write about Faithful because it's due back at the library, today. Hurry, hurry! I'll be posting a Tuesday Twaddle post, tomorrow, instead of Monday Malarkey because I want to go ahead and get this review posted. 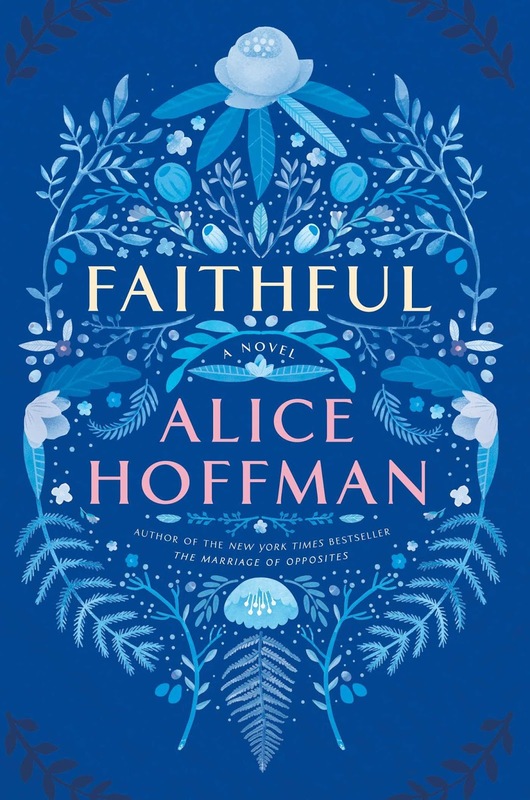 Faithful by Alice Hoffman is the story of Shelby Richmond, a teenager who is involved in a terrible car accident with her best friend, Helene. Shelby was only slightly injured. She has vague memories of seeing an angel and being covered with a warm coat, then finding out she was really fine while her friend was permanently damaged. Some think Helene works miracles and people wait in line to see her, hoping for miracles of their own. Shelby is skeptical of Helene's ability to work miracles and can't bear to see her. Shelby has received postcards encouraging her to start living, again, since her accident. But, she doesn't know who is sending them and she is unable to determine how to move on. After Shelby's accident, she becomes so deeply depressed that she's hospitalized for several months and then she turns to drugs and spends most of her time sleeping. Her drug dealer is a boy from her high school, Ben. When Shelby and Ben begin to spend time together, it becomes clear that Ben wants much more than to be her drug dealer. But, Shelby is not sure she will ever be able to function, again. Can Ben help her through her crisis? Who is sending Shelby the encouraging postcards that are the one light in her life? I'm just going to quickly tell you what I loved about Faithful. It goes from the time when Shelby is depressed, post-hospitalization, to sometime in her twenties. While she eventually comes to terms with her guilt and depression, Shelby is forever changed. But, what transforms her is her love of animals and this I loved with a passion. I'm an animal lover and I know how good it feels to take in a fur friend who has been rejected and may not otherwise have ever found a home. I could relate to the way her rescue of animals served as her salvation. I won't give away the details of the book but Shelby also becomes involved in an unusual and lasting friendship, and is loved by Ben in a way that helps her to take the baby steps back into life that she might not otherwise have been able to make. You're never certain whether or not she and Ben will last because Shelby is still so damaged, but in that regard the book felt oddly realistic, if a bit disappointing. 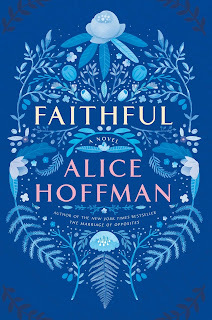 Highly recommended - I liked Faithful more than most of my friends did, partly because of the fact that the pages flew and I cared about Shelby, partly because I found it plausible and oddly satisfying, even though parts of the book are disappointing. You may want her to make a certain decision, for example, and she goes the opposite direction. I overlooked those discomforts because Faithful is, in the end, a book that peers around dark corners to find the bright rays of light that keep a person going after a life-changing crisis. Having a nice bit of lap time. 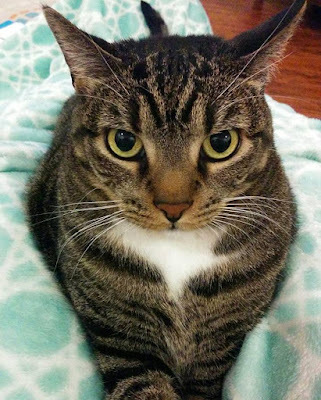 Fiona's ears are back because she doesn't like having her picture taken but lap > running from camera. I finished The Nightingale in tears, the night before last, on the eve of my book group's discussion. Remind me to put it on the tearjerker list for 2017. I was very moved. The Nightingale is the story of sisters Isabelle Rossignol and Vianne Mauriac. Isabelle was just 4 years old when their mother died, Vianne old enough that she was married just a few years later. Both were wounded by the rejection of their father, who suffered from PTSD and was never the same after the first World War. Unable to cope with the loss of his wife, he sent the two girls to live in their second home with a stranger in charge of their care. The book begins as Vianne's husband, Antoine, is leaving to serve in WWII and Isabelle is on the verge of being kicked out of a finishing school. When she arrives in Paris, Isabelle is determined to stay with her father but then the city is occupied by Nazis and he sends her to live in the town of Carriveau with Vianne, thinking she'll be safer. What follows on her journey to Vianne's is a horror that Vianne simply cannot comprehend when Isabelle tries to explain. Isabelle has seen the cruelty of the Germans and will do anything she can to resist while Vianne is in denial. Isabelle leaves Vianne's house to do what she feels she must. Then, a Nazi is billeted with Vianne and her daughter. What will happen to Vianne and Isabelle? Will they survive the war? What has become of the Frenchmen who didn't return after the occupation began? Will any of Vianne's Jewish friends and their children survive? The Nightingale is an amazing book. 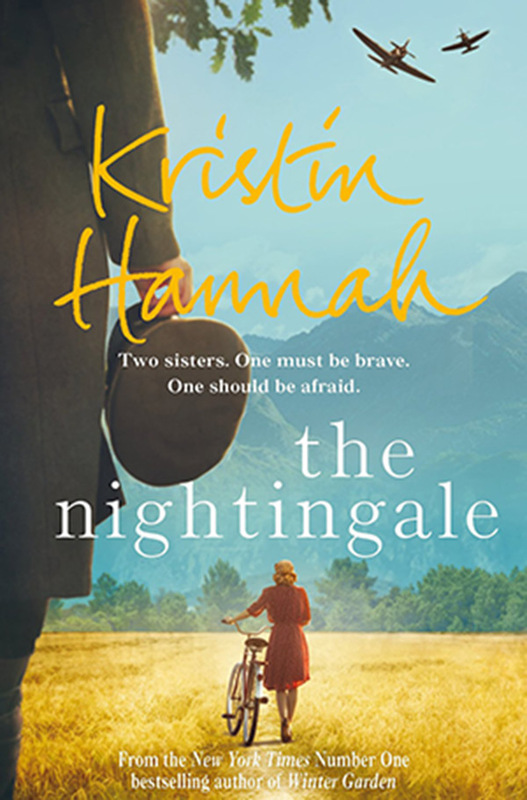 One of the things my friend and I discussed over dinner, before we went on to book group, was the fact that The Nightingale covers the entire war from the French perspective, from when the men leave home to fight to the liberation of the remaining captives from concentration camps. That alone is an amazing feat and a feature of the book that gives it more depth and perspective than many WWII books I've read. And, the scenes are incredibly vivid. When you read about one of the main characters, you have that "in their shoes" sensation. I always felt like I could feel the cold and the hunger and the pain. It was a visceral experience. In fact, that was one thing that was brought up in the F2F gathering: a couple people said they could not imagine the amount of self-restraint that it would require to slowly, slowly, slowly ration out what little food one had. A couple people said that the scenes about the lack of food made them hungry. I don't want to say too much about the plot of the book, apart from the obvious. Isabelle is on the ground during the bombing of the refugees leaving Paris and that's crucial because it firms her resolve not to quietly give in to the enemy. It's clear that she will become a part of the Resistance but what she will do, of course, you won't know till you get there. I don't want to give that away. The level of risk to her increases as the war progresses and it is entirely by choice. She is absolutely heroic, almost mindlessly so. You can't help but admire her. Vianne, on the other hand, is more naive about the threats to her family and plays it safe for a very long time. Eventually, she feels compelled to do her part and is equally heroic but in entirely different ways. This leads to another thing we talked about in book group: the fact that The Nightingale makes the horrors of living in an occupied country so clear. One of our group members said, "I would rather have been a man at the front line being shot at than a woman left behind." Highly recommended - I don't feel like I have adequate words to describe the breadth and meaning of this book. It is as genuine as a WWII novel can be, describing with detail the unfolding horror that ordinary citizens lived through in Occupied France. It's a hard read, but exceptional. Side note: While I have known I would read The Nightingale for a long time because it's a WWII novel, I honestly dismissed all the praise because I've always thought of the author as purely a romance writer (this is the first time I've read her but it will not be the last). Not that I don't think there are excellent romance writers because I know better, but I just don't read a great deal of romance. There are moments that you can see the romance writer peeking through, definitely. But, they're few and far between. The Nightingale is a gritty novel, in many ways, definitely not for the faint of heart. Kristin Hannah did not tippytoe around hardship. She made you feel it to your bones. A note on the cover: I ordered my paperback copy from Book Depository, in case you're wondering about that cover. I presume it's the UK edition. I chose it because I prefer paperback. After the death of her mother, Rachel was sent to England to live with her grandparents. Now 18, she has decided to return to her home in Kenya, in spite of her father's letter advising her not to come home. In Kenya, Rachel finds that a lot has changed. Her father has a new companion and she is not the kind, welcoming spirit that Rachel had in a mother. Bitter, intolerant, and nervous, Sarah has driven away old family friends and tries to keep an iron grip on her son, Harold. The only person who seems at all friendly is Nate Logan, and he has fallen out of Sarah's favor. Meanwhile, the country is in political upheaval. The Mau Mau, native Africans who are tired of the imperialists taking their land and their rights, have become violent and are killing the natives who won't join them. And, they've started killing white landowners, as well. Will they succeed at uniting Africans and driving the whites away? Or will they be stopped before they reach the farm where Rachel and her family live? As Rachel tries to find a way to coexist with Sarah and find her place in her old home, she begins a secretive relationship that, in and of itself, is an act of betrayal. But, Sarah has another secret, one from the day her mother died. Will she share her secret before it's too late? It sounds like there's an awful lot going on but the storyline is actually pretty straighforward. Rachel goes home, there's a new woman sleeping with her dad and they plan to marry, the woman is not kind to anyone, has distanced the family from the servants, and restricts her son. Rachel's dad is under her thumb and he just wants everyone to get along. Rachel is also restricted in her movements but she finds that sewing outfits for the families who live on a stretch of their land and teaching the children helps keep her occupied and happy. Because the family is even more isolated by Sarah's brusque personality than the distance between farms alone, Rachel befriends the people whose children she teaches and the man who used to tutor Rachel but now works as a mechanic. There's a lot of uncomfortable interaction between unlikable characters, an affair, and a political undercurrent. What I enjoyed most about Leopard at the Door was learning a little about a particular time and place: 1952 in Kenya. I had heard of the Mau Mau before, but I have no idea where, and it was fascinating reading about what led to the rebellion of the African natives against the whites. It sounds like a common theme: imperialists take over, grab all the property, try to change how the natives live and treat them as inferiors, and then the natives rebel. What keeps the pages turning is the knowledge that eventually the rebellion is going to end up on the doorstep of the main characters. There's no way around it. And, the Mau Mau are brutal. Hard as it could be to read about, I enjoyed the learning experience. However, there were some irritations. Rachel is one of those characters who eventually begins to feel like what romance writers call a heroine who is "too stupid to live." She has witnessed something in the past, but for some reason she's kept it to herself. She knows that a man who keeps returning to her father's farm is dangerous, for that reason - not just dangerous in general, but dangerous to her. I never could understand what possible reason she could have for remaining quiet about him. I would have said (spoiler - highlight if you dare), "That guy touched me in my private places and killed someone, Dad!" Her decision to stay mum didn't make a lot of sense to me. I also was frustrated by the lack of contractions in the book. "I do not believe you," she says. I dream that I am standing with my back against the garage wall [. . . ]. There are maybe a handful of contractions used in the entire book and that bogs it down. It's a very slow read. Generally, lack of contractions in speech and narrative are rookie errors unless they're used to show a particular accent. She's not a first-time writer, but I think the author could benefit from doing a single edit of future novels with an eye toward making contractions for the sake of flow. 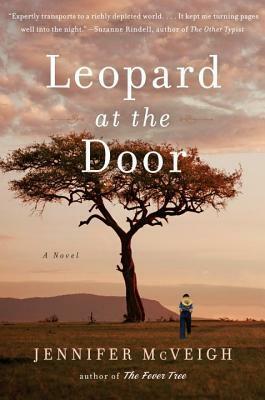 Recommended but not a favorite - I don't regret reading Leopard at the Door and never considered abandoning it, but it was not a favorite because Rachel's actions don't make sense, much of the time. Why would you stay in a country where people are being slaughtered or burned inside their homes if you had an option? Why would she not share information that could keep her and her family safe? And, the rest of the characters are mostly unlikeable. Nate is the exception and he is only present at times, and briefly. I would have loved it if Nate were present more, just to balance out the characterization, which leaned negative. I also found much of the book predictable. However, the ending surprised me and I liked it. And, I loved the learning experience. I gave Leopard at the Door an average rating. Hello! How are you, today? Just thought I'd ask. Happy Martin Luther King, Jr. Day to my fellow Americans! The View from the Cheap Seats by Neil Gaiman - I actually stopped myself from reading further, this week, after I decided the last two essays I read contained so much wisdom that I needed to go buy some highlighting pens and mark them up. I can't remember the last time I used a highlighter; that's why I had to go buy a couple. The Wars of the Roosevelts by William J. Mann - Still loving this book but it's one that I just pick up occasionally and usually I'll read about 25 pages. It is seriously going to take me ages to get through but I've got a fascination for the Roosevelt family and am really enjoying it, even though I'd like to go back in time and give Theodore a good pop in the nose for what he did to his brother. The Nightingale by Kristin Hannah - F2F discussion is Wednesday and I'm pretty sure I'll be done with the book in time. Very relieved that it arrived with just enough time to spare; I waited a little late to order it from Book Depository. Fiona Friday - Break between exercise sessions (cat photo) In case you're wondering, since the color of this one was terrible, I changed it to black and white, today. 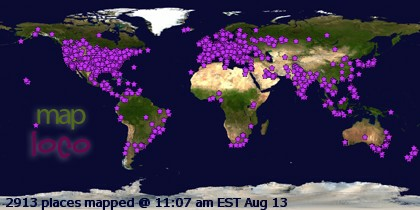 Quite a busy blogging week. I was determined to get 2016 wrapped up and I'm happy that I succeeded. 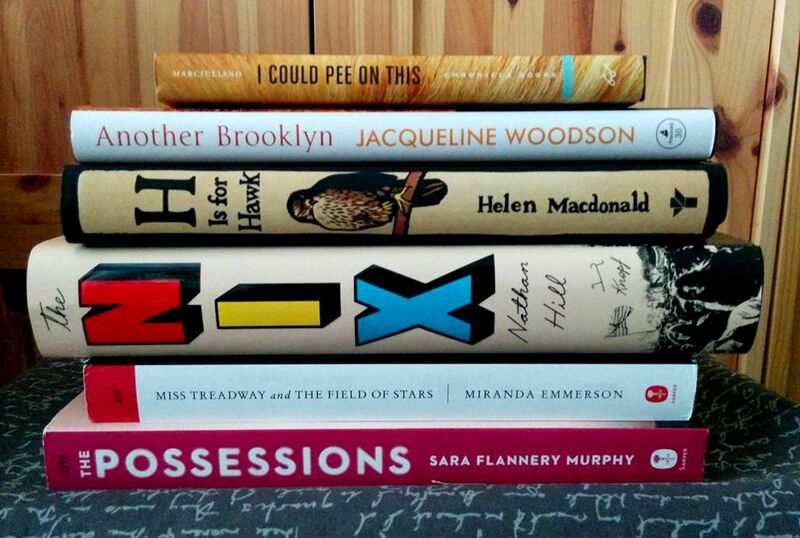 I may still eventually write about favorite reads from last year but I can't say, for sure. I've handwritten a list of everything I read so I can make classification marks (classics, favorites, translations, etc.) but I haven't worked on that, in a few days. I'm in no big hurry. I know most people post their favorites before the year even ends but I can't talk myself into doing that. What if I read a favorite book on the last day of the year?! So, we'll see how that goes. An oddity of 2017, so far, seems to be my urge to read nonfiction. There are some fiction titles I'm eager to read but it's the nonfiction that's calling to me the loudest and it's all I can do to stop myself from adding yet another nonfiction title when I have two chunksters in progress. It'll be interesting to see if January has already set the tone for the entire year or that's a temporary thing, but I really am enjoying the nonfiction I've read and am currently reading, so far. Really, this was more a case of the cat crazies, but I love it that when Isabel is acting nutty and pulling herself arround and around the scratching post on her cat tree. She'll stop if I speak to her and listen to me for a minute before going back to being a nut. Some links lead to a post with a single paragraph about a particular title (often within a summary or otherwise longer post) but most lead to complete reviews. I'm not going to write a paragraph about each book, as I usually do, since I've already written about all of my December reads. Hop through the links to read about them. Favorites were Born a Crime, The View from Flyover Country, Appointment in Samarra, Wild Pork and Watercress, Rebirth, and I Could Pee on This. Born a Crime is exceptional, more a book about how race impacted Trevor Noah's life in S. Africa than a general memoir. The View from Flyover Country is a little repetitious but fascinating. I learned a lot about why 20-somethings have it a lot harder than we ever did. 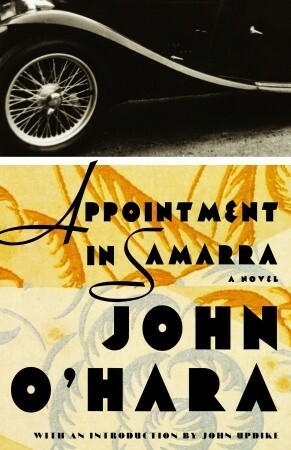 Appointment in Samarra was my classic choice and I enjoyed it. I liked the writing style and it was especially cool that Sherlock kept referring to the fable upon which it's based in the first episode of the new season. Wild Pork and Watercress was fun because it was mostly survival and I love survival stories. Rebirth was much more interesting than I expected and had an impact that I didn't realize until I went back to review it and pulled out a few quotes. I Could Pee on This is a hoot. 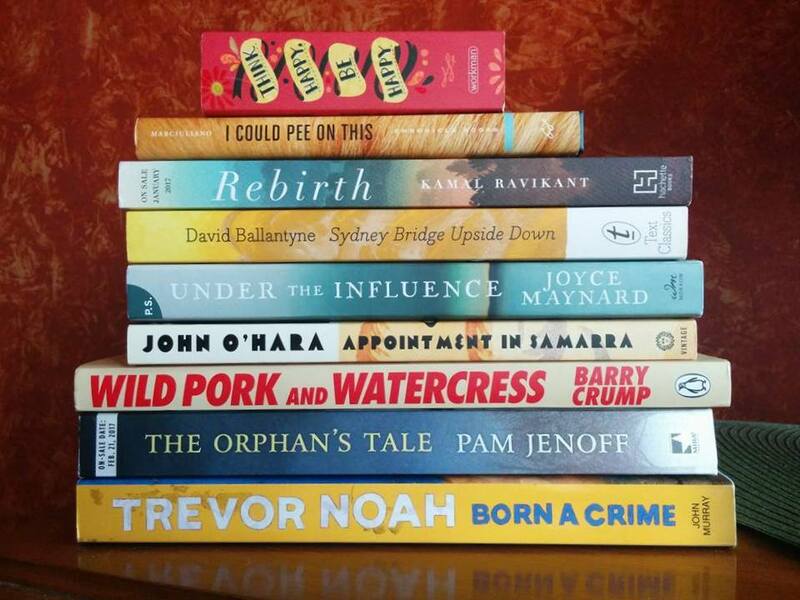 I liked but didn't love The Orphan's Tale, Sydney Bridge Upside Down, and Under the Influence. The Orphan's Tale offered an interesting perspective on WWII that was new to me but I still disliked the circus setting; it occasionally bored me reading about the aerialists practicing. Sydney Bridge Upside Down was very good but when it turned sinister, I confess it was pretty upsetting. I liked it, though. It just wasn't a favorite. I'm more impressed with the writing than in love with the story. And, Under the Influence was just kind of meh till the end. The ending was good, though. Think Happy, Be Happy is cute - a book of quotations that are upbeat with marvelous illustrations. It's a fun little thing, gimmicky but in a good way. I have a couple books that are similar in style but with different topics (one is a book of funny things spouses have said). 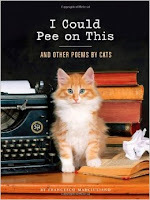 I find books like Think Happy, Be Happy and the cat poetry the kind of smile-inducing books that are great for rereading when I'm in need of an upper. Next up will be the full year's list of books read! This will be the last post covering the books I neglected to write about in 2016. Fortunately, I kept up pretty well, in general. 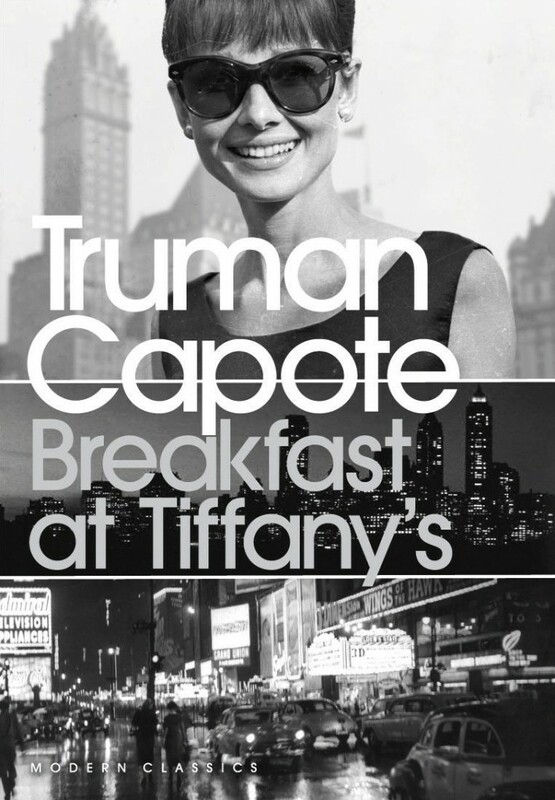 Breakfast at Tiffany's by Truman Capote is a book that I had on my shelf for a while but had not gotten around to reading. It was my F2F book group's September selection and that gave me the nudge I needed. Since it's a classic, it was also my classic read for the month. I've attempted to watch the movie and found it bizarre and hard to follow, but I'm sure I would enjoy it, now. Holly Golightly is an interesting character, a woman who escaped her past and remade herself as a woman living off rich male companions. Her story is told from the viewpoint of a neighbor and friend. Now that I understand the character and her motivations, I think I would get the movie just fine. But, I haven't watched it, yet. The Brief and Frightening Reign of Phil by George Saunders is a book that I happened across when I decided I wanted to own a copy of Tenth of December, a book I read and loved, also by Saunders. Honestly, it's probably the cover that convinced me to buy it. I love that cover. And, the content is every bit as fun and wacky. The inhabitants of a place called Inner Horner come into dispute with their neighbors in Outer Horner when their home suddenly shrinks and they no longer fit on the tiny bit of land alloted to them. 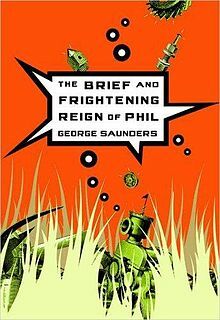 A tiny, hilarious book that I presume is an allegory (but, honestly, I just don't know), The Brief and Frightening Reign of Phil is bizarre, thought-provoking, strangely insightful, and also one of my favorite reads of the year. I'm glad I bought it; I plan to reread this one regularly. 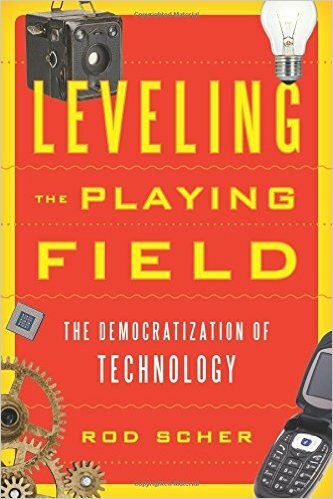 Leveling the Playing Field: The Democratization of Technology by Rod Scher was not meant to end up in the end-of-year batch, review-wise. I think I must have not realized I hadn't reviewed it at the blog because I put up a review at Amazon when I was asked to do so. Mea culpa. By "the democratization of technology", the author means that most inventions go from being hard to acquire and expensive to cheap and widely available. He starts out with the invention of fire and then progresses to such things as books (how they became more widely available with the advent of the printing press), computers, 3D printers, The Internet of Things, and the GPS. I had particular favorites amongst the chapters; I can't say why, but the book is fascinating and very readable. A side benefit to this book is that the author described a few websites, one of which I zipped off to check out. I ended up finding a perfect Christmas gift at that website, so thank you, dear author, for that. 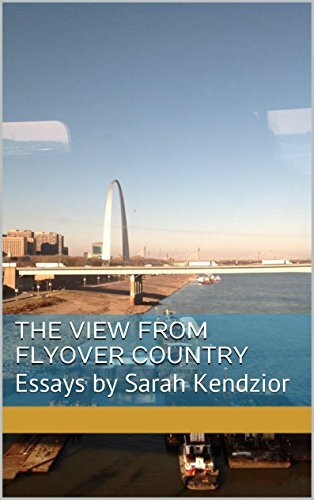 The View from Flyover Country: Essays by Sarah Kendzior is an e-book that I purchased after reading a ton of Kendzior's tweets. There's a bit of repetition within the essays but that was not a bad thing for me because it helped clarify some of what she had to say about things like the difficulties faced by a younger generation in which the norm is quickly becoming a requirement to work an unpaid internship in order to qualify for a job and why internships and other poorly paid introductory jobs mean some fields are dominated by people who are already economically advantaged. Although I can't recall the other topics, a good portion of the essays dealt with racial and economic inequality. A very good read and it's notable that she has a doctorate in authoritarian regimes, so her tweets about the incoming Presidential administration are terrifying but informative. 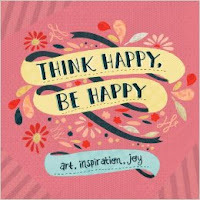 Think Happy Be Happy has no credited author but is a collection of inspirational quotes, sayings, and some miscellaneous fun things like playlists. I've got a flag marking one of those, the "Fearless Playlist" with songs like "Just Say Yes" by Snow Patrol. On the opposite page it says, "'I am not afraid of storms for I am learning how to sail my ship.' -- Louisa May Alcott " So, it's basically a little book of, as it says, "Art, inspiration, joy," very upbeat and beautifully illustrated. One of my favorite pages says, "Hell yes!" with a little devil in a burning background. It was part of the reason I chose "Yes" for my word of the year. I haven't torn that page out, yet, although I'd like to. I'm not so hot at damaging books. I Could Pee on This and Other Poems by Cats by Francesco Marciuliano is just as silly as you'd expect but it has photos of cats and it made me laugh so I'm glad I finally managed to acquire a copy. I think I may have mentioned this, already, but I stood in Target and read bits and pieces of I Could Pee on This when it was a fairly new release, maybe a year old. It made me smile, so I put it on my wish list and I just finally found it at a price I found tolerable when we were visiting Kiddo, a couple weeks ago. While the guys went into an office supply store to find something to organize papers, I sat in the car reading and laughing. I'll reread this one many times. It's worth owning a few small things that are guaranteed to make you smile. That's it! 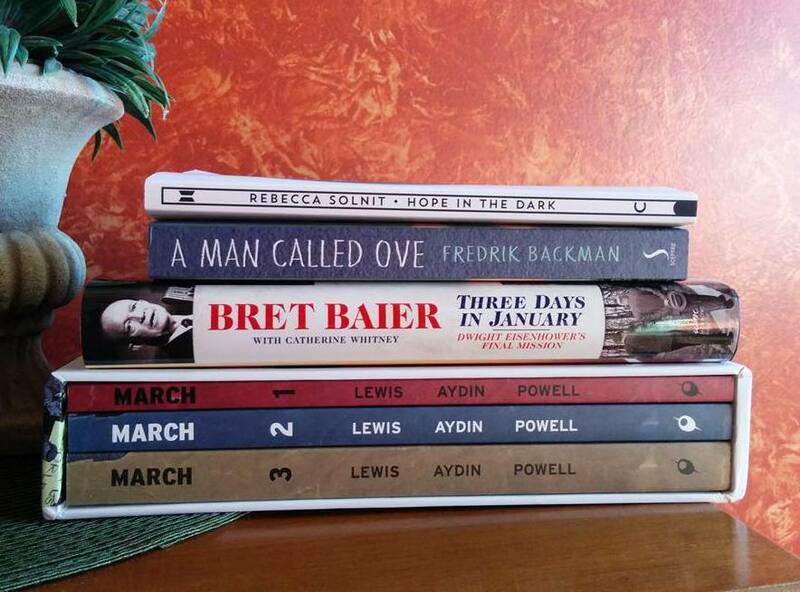 I will post my end-of-month for December (it will be brief), publish the full list of books read, and then I'm done with 2016!! 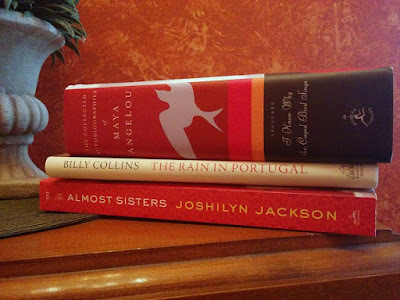 After writing that last post, I realized there was no recent read left that I thought needed even mini review treatment, although a couple of the books I neglected throughout the year really should have gotten reviews fresh from the reading. I'll mention those when I get to them. 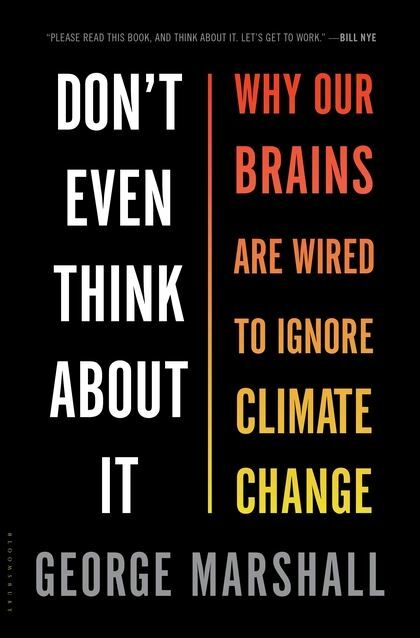 Don't Even Think About It: Why Our Brains Are Wired to Ignore Climate Change by George Marshall is a book not so much about climate change and the stats that prove it but how people think about it, what makes them prone to denial or understanding, and why certain circumstances make it more likely that they won't connect an event to climate change. An excellent, thought-provoking book that I thought about for so long I didn't get around to reviewing, this is probably one of two books I seriously regret not getting around to saying anything about. It's more psychology than climate science. While the author approaches both sides and does his best to stay neutral, he falls clearly on the side of the 97% of scientists who are convinced that climate change is going to kill us all (he's not shy about saying so) and describes climate scientists as a gloomy lot, because they anticipate their doom. This one deserves a reread. It's a 5-star book. 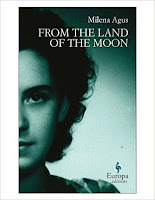 From the Land of the Moon by Milena Agus is a Europa translation with a surprising ending, so twisty as to be baffling. I found another reader to discuss with and we were uncertain what actually happened in the end but it appeared that the narrator was unreliable and the ending cast the entire story into doubt. I'm glad I read From the Land of the Moon but it was definitely a head trip. 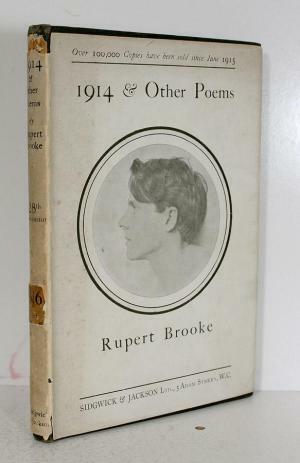 1914 and Other Poems by Rupert Brooke is one of the few books I don't remember all that well. I knew of Rupert Brooke as one of the war poets but as far as I can recall, the book was not composed entirely of war poetry. As with most poetry, some of it made sense and even resonated, some was either baffling or simply beyond my understanding, some I liked and some I did not. In the end, I'm guessing I didn't have much to say about it and that's why it ended up unreviewed, but I'm always happy to have read a volume of poetry because I love trying to engage with an art form that is powerful due to the careful and precise use of wording, whether I get it all or not. 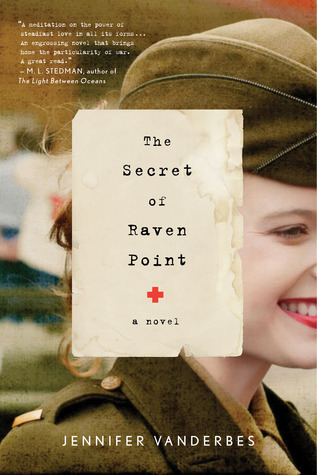 The Secret of Raven Point by Jennifer Vanderbes is a book I read while on vacation, a WWII story about a nurse, her patients, and a doctor for whom she has feelings she must keep to herself. When I read this book, I really enjoyed it but I was shocked how quickly I forgot what it was about. To this day, I can't remember the details. But, I have to wonder if that has to do more with travel fatigue than the content of the book. At any rate, I know I enjoyed it. I just don't remember much about it. 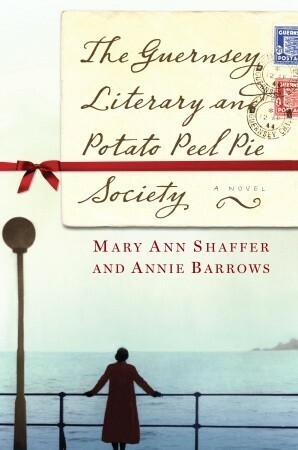 The Guernsey Literary and Potato Peel Pie Society by Mary Ann Shaffer and Annie Barrows was, of course, the hot book about 5 years ago. Maybe longer, I don't know. At any rate, I put off reading it for ages and I don't know why. I finally got to it in 2016 and, like everyone else, I loved it. I found the story of the group of Guernsey island inhabitants who use a book club as cover for their activities charming, sometimes funny, but at the same time fiercely real. It's a rare book that can be funny, serious, and deeply moving. I opted not to review the book because everyone else already reviewed it but if there's anyone left out there who hasn't yet read The Guernsey Literary and Potato Peel Pie Society, quit putting it off. 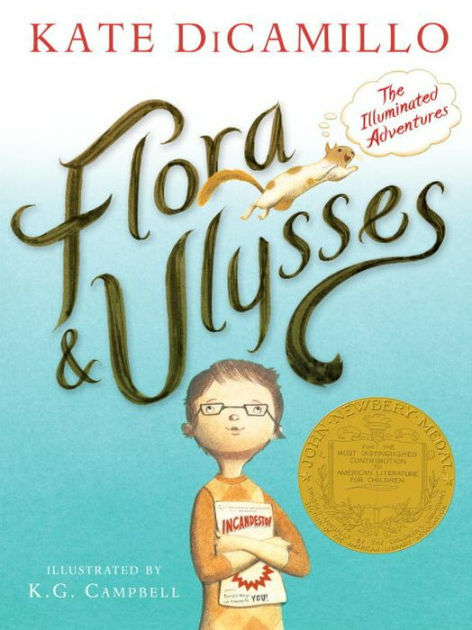 Flora and Ulysses by Kate DiCamillo is a book I bought and had autographed - or maybe just bought autographed - at our local book festival. 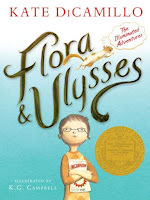 I got to hang out with blog friend Brittanie during the author's hilarious question/answer session and then came home and gobbled down Flora and Ulysses, that night. It's the story of a squirrel who is sucked up by a vacuum cleaner and when he does, he gains the ability to write poetry. But, he really wants to be a superhero. Funny, cerebral, and heartwarming (although not my favorite by the author). Kate DiCamillo is a gifted storyteller. I can't imagine not liking anything she has ever written or will write. A Square Meal: A Culinary History of the Great Depression by Jane Ziegelman and Andrew Coe is one of the best works of nonfiction I read in 2016 and I feel awful about not reviewing it. You should see my copy; it is chock full of colorful flags. I still think about it regularly. It's particularly relevant because a great deal of what was done during the Depression with the back-and-forth about social programs and whether or not people were becoming too dependent upon handouts and should only get seeds to grow their own food . . . similar things are being done, today, with the whole "Pull yourself up by your bootstraps and stop depending on SNAP!" thing. I had no idea, actually, about the bread lines being as controversial as the distribution of food to families, nor did I ever contemplate the fact that it was always the men standing in food lines. Funny that I never noticed that. I also gained a new admiration for farm wives of that time period and learned a lot about how home economists led changes in the way we live and cook. I need to find my copy and pull some quotes from this one. It's a crime that I didn't get to it, honestly, particularly given its application to the way we're still bickering about whether or not people living in poverty should be served by food programs. 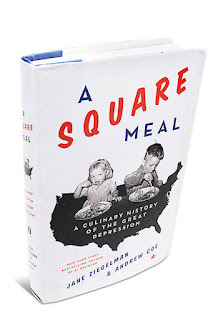 If you have any interest at all in the Great Depression, A Square Meal is a marvelous resource and a fascinating read. Part 2 is coming up. Since I have so many reviews remaining from 2016 and another 2 to hit in 2017, I'm going to go ahead and revert to the mini review format, for now. If there are any books that I believe require more depth in reviewing, I'll save them for separate posts. I'll post my December reads, later today. 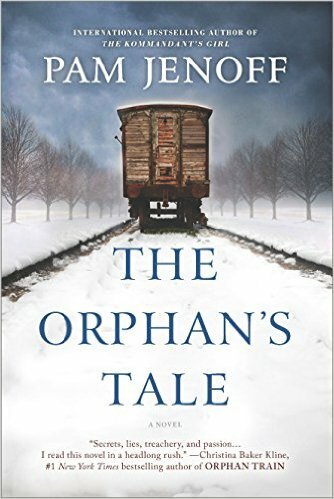 The Orphan's Tale is my first read by Pam Jenoff, in spite of the fact that she writes about WWII. I don't know what took me so long to get to her books. The story is about two women. Noa was kicked out by her family after falling pregnant at 16, the father of her child a Nazi soldier. Separated from her own child, she has saved a baby found in a freezing train carriage. Astrid was forced to divorce her Nazi husband and leave her home because of her Jewish heritage. Astrid grew up in a German circus and her family has disappeared. When a neighboring circus takes her in she is grateful but haunted by the loss of her family and perpetually in danger. After Noa shows up with the baby and is also given refuge, Astrid reluctantly teaches her to work on the flying trapeze. When they travel across Germany and Noa falls for the son of a mayor who works closely with the Nazis while Astrid's boyfriend refuses to stop breaking the rules, the dangers sharpen. Will Noa and Astrid be able to keep each other and the baby safe? There was a lot that I loved about The Orphan's Tale. I liked the fact that I learned about a new facet of life during WWII. I liked the fact that it focused on specific issues that were problematic for women. And, I thought the ending was both heartbreaking and beautiful. There were a couple problems I had with the book, though. The main one was stylistic. The author used the passive voice and it took me ages just to learn to stop mentally rewriting sentences. So many had dones and had beens. The Orphan's Tale needed a dedicated editor to shift its prose away from the passive voice. The other problem was minor: I really don't like circus settings. I thought I would be okay with a circus setting and I did enjoy learning about what it was like within that kind of setting during WWII, but it still was not a setting I enjoyed and I occasionally found myself bored with the details of training someone to be an aerialist. Recommended but not a favorite - I'm glad I read The Orphan's Tale and I will happily read more by Pam Jenoff but there were some minor frustrations. Definitely a unique setting for WWII and solid storytelling. Crucially, the ending felt perfect in a way few endings do. Appointment in Samarra by John O'Hara - My classic choice for December, I knew Appointment in Samarra was not going to be a happy tale. I'd read about it a bit and the fable about death finding a merchant in Samarra makes it clear that the ending will not be a pleasant one. But, the writing is superb and I was quickly swept into the story. Julian English finds one of the members of his club particularly annoying and thoughtlessly tosses his drink in the man's face. The next day, his wife Caroline talks Julian into going to apologize to Harry Reilly, the victim, but Harry is unwilling to see him. It then begins to become clear just how much damage Julian has done to his standing. Slowly, Julian begins to unravel, in the process throwing away everything he's worked for and ruining his closest relationships. What will happen to Julian and Caroline? Well, the fable makes it pretty obvious but it's still just a bit shocking, in the end. Highly recommended - Sad as it is, Appointment in Samarra is impressively written and when I look back at 2016's classic choices, I have a feeling it will be one of my favorites. 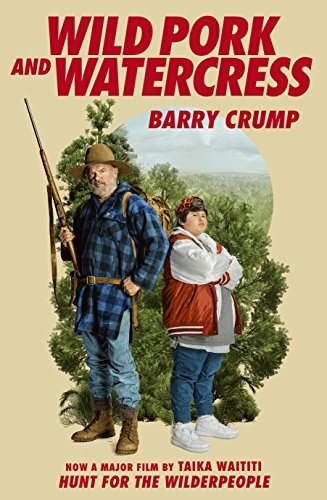 I ordered a copy of Wild Pork and Watercress by Barry Crump after watching the movie Hunt for the Wilderpeople and finding out that it was based on a book. I love watching a movie and comparing it to the book (better that way than reading the book first and being disappointed, actually) and they were definitely poles apart, although both are set in New Zealand - so, at least the book didn't suffer the fate of being Americanized. Ricky Baker has been taken in by his Aunt Bella and Uncle Hec. 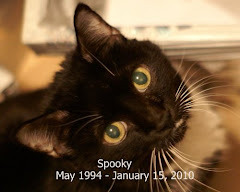 At 12 years old, he's overweight and has spent much of his life being shuffled about. Aunt Bella is warm and loving, a great cook, and happy to step in as a surrogate mom. Uncle Hec is a curmudgeon and former inmate. When Aunt Bella dies suddenly, Hec is heartbroken and decides to head into the bush. But, Ricky will be sent back into foster care if Uncle Hec doesn't take him along. Reluctantly, Uncle Hec agrees to let Ricky come along. They head into the bush to hide out till Ricky turns 16, when he'll be free of the social system. That's the book version and they do, in fact, succeed in hiding out for about 2 years, sometimes while being pursued by authorities. Ricky and Uncle Hec make a single friend while on their adventures and Ricky becomes an expert hunter. Because the book is a survival story in which they hide out for literally years, it's quite different from the lighthearted comedy film. But, both are terrific in their own ways. The book is wonderful for being a survival story that ends mysteriously, the movie for its sense of humor. Both describe a building relationship with heart and they both have meaningful, yet extremely different, endings. Highly recommended - I ordered my copy of Wild Pork and Watercress from Book Depository and it was shipped from Australia. Then, it became available on Amazon. Oh, well. It was worth the wait. I enjoy survival stories and it was fun mentally comparing the book with the movie, as I read. Wild Pork and Watercress has the feel of a YA because Ricky tells the story, although I'm not sure how it would be shelved in New Zealand. Besides the three books I'm reading (two of which will take me forever to get through, although I'm enjoying them both), I started a classic choice but I'm not sure this one is going to click for me, so I've opted not to write it on my list, just yet. If it eventually takes, you'll know about it. I planned to start my second personal challenge - the first being a continuation of my monthly classics challenge - last night, but I also planned to finish my Monday Malarkey post and you can see what became of that. I fell asleep on the couch, instead. My second challenge is to read at least one feminist title per month and I'm not too strict about what I will consider "feminist". I have, for example, a copy of Hidden Figures coming. A book about women who were successful in their fields but without public acknowledgment works for me. First on the feminist reading list is We Should All Be Feminists by Chimamanda Ngozi Adichie, partly because it's a mere 65 pages long and we're getting close to the middle of the month. The fact that it's already the 12th 10th of January (haven't replaced my desk calendar, so I looked at December) means I'm not going to worry about how long it takes me to finish up my last reviews from 2016. Clearly, trying to shove through them has not worked, so I'll write when it works for me. I'll post my 2016 list tomorrow, though. Might as well get the end of month and end of year lists out of the way, right? We had a new experience, this week. Isabel was whining at me because she was bored, so I decided to look up squirrel videos for cats. Boy, was that a hit! 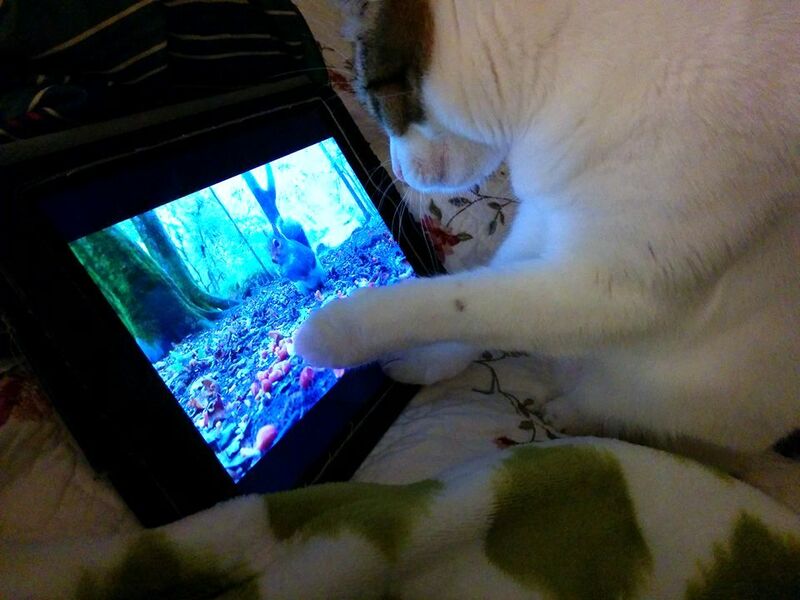 She watched the video I loaded (which had both a squirrel and a robin) at least 4 or 5 times and tried to turn the iPad back on when I decided she'd had enough. I'm glad to have an extra option besides dangling strings and rolling jingle balls because Izzy is an active kitty who sometimes goes a little nuts when she can't decide what to do. "Two partners," he whispers into my ear. His voice is hoarse. "Fear and faith. The one you dance with determines your life." "Il n'est pas votre blessure qui vous rend spécial." Then he leans back, waits. "It is not your wound that makes you special." "People have this amazing resiliency, this power to live through the worst things imaginable -- famine, genocide, you name it -- and still they survive. Not only survive, but sometimes flourish. How? How do they do it? I would venture that it's not by focusing on the 'why?' but moving ahead with the 'now what?' You might want to try that." Rebirth is the story of a young man named Amit, who decides to walk the Camino de Santiago on a whim. Amit's father has recently died and Amit left his girlfriend abruptly to scatter his father's ashes. After spending a little time in India, he is unsure about his original plan to become a doctor. When a stranger mentions the 550-mile path taken by pilgrims for many centuries, Amit decides to give it a go, more as a delay tactic than a personal challenge. At first, he has no real plan. He'll walk part of the Camino and then he'll make a decision. He calls his girlfriend and finds that he can't go back to the way things were, even if that's what he desires. But, as he begins to meet people on the hike across Spain and they share the wisdom of their years with him, Amit finds that he wants to continue the hike. Maybe, eventually, some of their hope will rub off on him. Rebirth is based on the author's hike on the 550-mile Camino de Santiago and it reads very much like a Mitch Albom or Paulo Coelho book, as stated in the publicity material. I confess, that kind of "life lesson fable" tends to turn me off and toward the beginning of Rebirth, I really thought it was going to be tremendously hokey. I wasn't sure I'd make it all the way through. However, after a time, I started to warm to the story. The lessons are very much in your face, told via conversation with wise pilgrims who muse about family, tell stories about the challenges they've endured, talk about living your life instead of focusing on your ambitions, etc. But, I particularly liked the Frenchman and the final character that Amit meets: Kat. Although they were clearly in the book to impart their wisdom, those two characters felt more real to me than most and they kept me going. In the end, I really liked the way Amit came to a decision about the direction of his life. It wasn't actually quite what I expected, and I appreciated that. 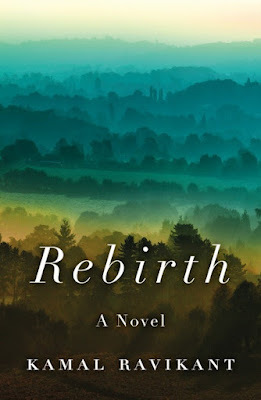 Recommended - While a book that calls itself "A fable of Love, Forgiveness, and Following Your Heart" is kind of suspect to me, I ended up enjoying Rebirth. I particularly recommend it to fans of Albom and Coelho, but if you're okay with a not-too-subtle book about finding meaning in your life, I think it's a good one. I found myself wishing I'd heard about the Camino de Santiago when I was younger and truly enjoying the trip vicariously. The monk returns, one hand raised in a blessing. That's from p. 119 of the ARC. Clearly, I am choosing not to give the finger to this concept. It made me laugh to look back and see that I'd marked this bit and completely forgotten about it. In fact, when Amit remembered the monk, later in the book, I just shrugged at the fact that I couldn't recall their interaction at all. I didn't even bother to flip back, didn't realize I'd marked this passage. My dears, I draw the picture of the wealthy couple standing in a darkened hallway, peering into a lighted room where black servants were lifting their voices in merriment and comradery, and I realize that living well is an art which can be developed. Of course, you will need the basic talents to build upon: They are a love of life and ability to take great pleasure from small offerings, an assurance that the world owes you nothing and that every gift is exactly that, a gift. That people who may differ from you in political stance, sexual persuasion, and racial inheritance can be founts of fun, and if you are lucky, they can become even convivial comrades. I started the year off right by reading a Maya Angelou book. 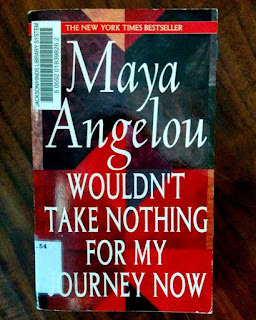 Wouldn't Take Nothing For My Journey Now is a book of short essays. 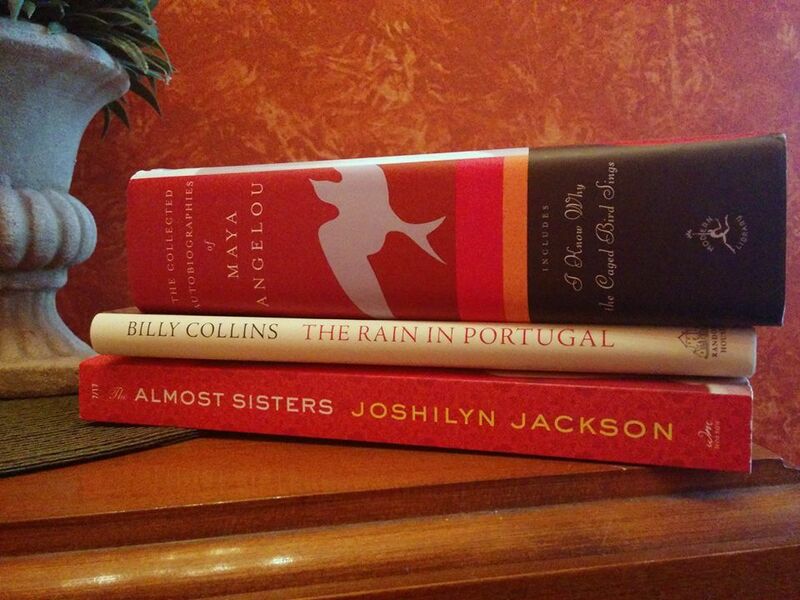 I've only read one other book by Angelou, but when I did I immediately got online and ordered her collected poems. This time, I got online and ordered her collected memoirs. 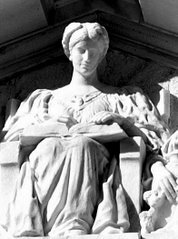 And, I'll plan on reading her poetry in April for National Poetry Month. Wouldn't Take Nothing For My Journey Now begins with a nice, feminist bang as her first essay, "In All Ways a Woman" describes a practice that has, I believe, now fallen mostly into the past. She talks about how demeaning it is to add the "ess" that used to define whether a working person was male or female. Postmaster, postmistress; actor, actress. It jarred me a little when I realized that female actors were simply being called actors, years back. I don't know exactly when that occurred but I agree with Maya. It makes a lot more sense to use a single term, rather than demeaning women by making it obvious when there's a female in a certain position. Having said that, I believe we still do call females in Congress "congresswomen". That needs to change. "Sister, there are people who went to sleep all over the world last night, poor and rich and white and black, but they will never wake again. Sister, those who expected to rise did not, their beds became their cooling boards and their blankets became their winding sheets. And those dead folks would give anything, anything at all for just five minutes of this weather or ten minutes of that plowing that person was grumbling about. So you watch yourself about complaining sister. What you're supposed to do when you don't like a thing is change it. If you can't change it, change the way you think about it. Don't complain. We all should know that diversity makes for a rich tapestry, and we must understand that all the threads of the tapestry are equal in value no matter their color; equal in importance no matter their texture. Highly recommended - A short gulp of a book at just 139 pages (with lots of white space between essays) but deeply meaningful. So glad I started the year by reading the advice of a wise, strong, amazing woman. I've been offline due to storms, for a few days, so first things first. Welcome to the dawn of a new year. 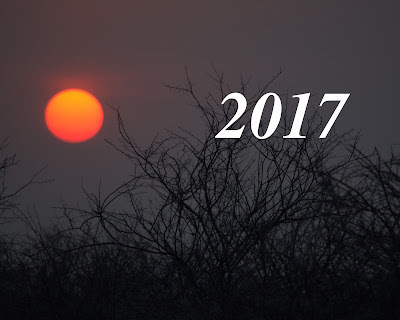 Hello, 2017! I hope you're a good one. Happy New Year, friends! I'm not entirely done with 2016, review-wise, so I'm going to go ahead and do the Tuesday Twaddle (Malarkey was inhibited by the presence of a spouse) and then work backwards. I really do wish I could start with a clean slate but I'll do my best to quickly catch up with myself. It should help not having a husband around. Nice idea, not shutting down the blog for the first time ever, but it didn't really work out because if family is around, I'll always be hanging with them. All my purchases came about during a road trip to take the desk Kiddo and Huzzybuns built over the holidays up to Kiddo's home in Oxford. He didn't have quite enough room in his little car, so we drove the parts up and the guys put the desk together, then we went out to eat and shopped at Square Books and Off-Square Books. 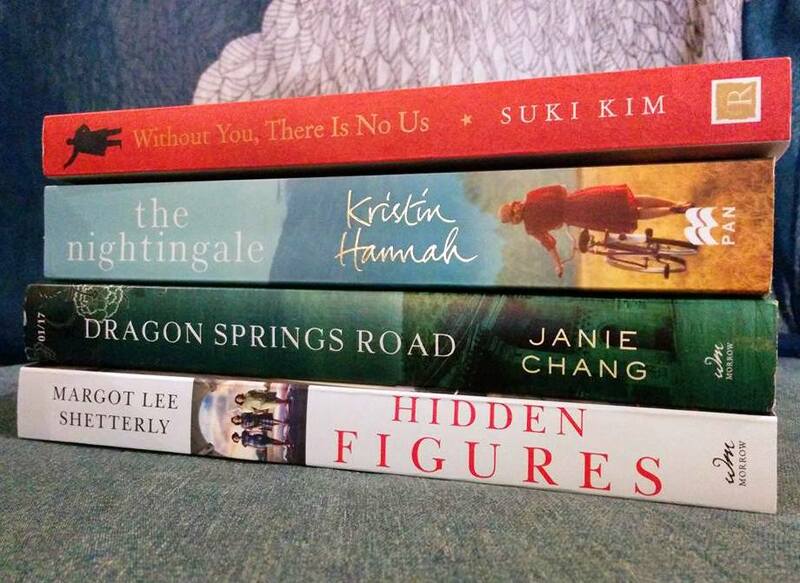 They just happened to have a number of books that were on my wish list. It was a bit of a splurge but I only got one book for Christmas so Huz didn't mind one bit. Cool. The View from the Cheap Seats and The Wars of the Roosevelts are both chunksters, so they will probably take quite some time to read. 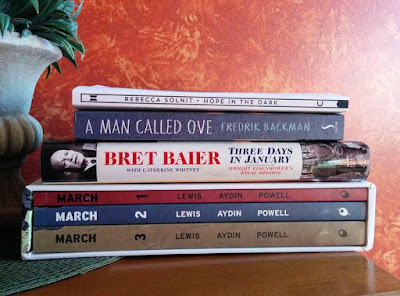 I'm trying to pace myself and mix in a little of each book, every day, so that I won't stall on the bigger books, as I often do. I've been enjoying reading various bloggers' and friends' word choices for #OneWord, this year. I'm not so great at sticking to my word so I skipped it, last year. This year, a really great one jumped out at me as I was reading Think Happy, Be Happy - a book that was sent to me by the delightful Carrie of Care's Books and Pie. It has a page with a little devil saying, "Hell, yes!" I thought, "That's my word, 'yes'," the moment I saw it. I'm the opposite of most women who have trouble saying 'no'. My problem is that I'm too good at it - too good at saying, "I'll tackle that later," or "No, thanks, I really don't want to do that." So, this year is my year of "yes" and that includes some personal goals I've avoided. In fact, I decided to not even try for one particular goal that I've been working toward all my life, last year. I will get back to work on it, this year. I may never succeed but I can keep saying "yes" to trying. 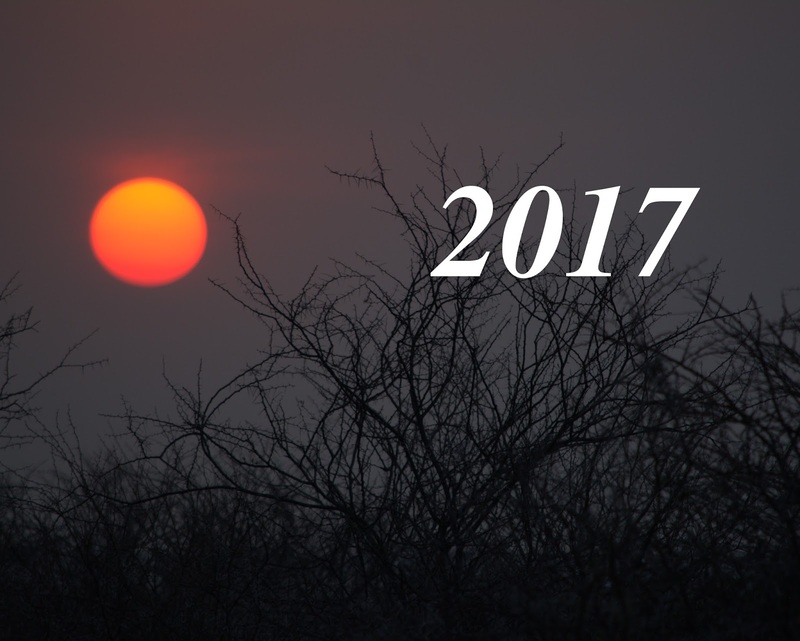 Happy 2017 to all my book-loving friends!